In mathematics, a nonlinear system is one that does not satisfy the superposition principle, or one whose output is not directly proportional to its input; a linear system fulfills these conditions. One of the greatest difficulties of nonlinear problems is that it is not generally possible to combine known solutions into new solutions. Regard to non-linear circuit system analysis, the most widely applied techniques used is the linearization, which separate the non-linear system into a linear part plus a non-linear part. Give small amount of vibration at a large operating point. This forms the foundation of analyzing semiconductor based non-linear circuits analysis, such as transistors and diodes. Large and small signal models, DC and AC analysis are all derived from this principle. 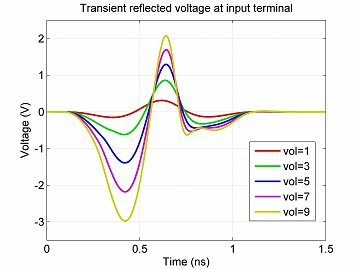 Another popular techniques applied in analyzing non-linear circuit systems is transient iterative method, which sets a external control parameter such as gate and cut-off voltage to perform a switch control. Such method is relatively simpler because the control parameters can be easily modeled and implemented locally within the non-linear devices. And the non-linear behaviors will be coupled into the system through iterative interactions between the non-linear devices and other systems. 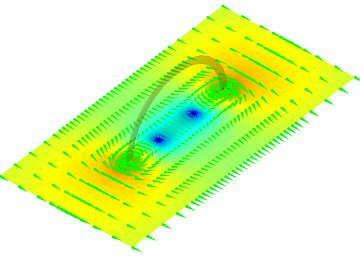 In this page, we simulated several examples using the software Wavenology EM, showing some abilities of the software in performing full-wave analysis of non-linear microwave devices. To add a non-linear device to the microwave structure, we first investigate how to make a real SPICE model in Wavenology EM to represent the real devices. As an example, a varactor diode is chosen. 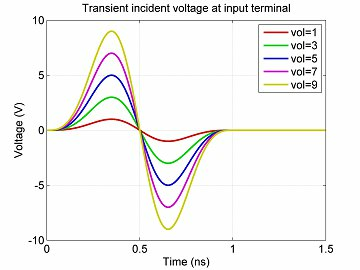 We first use a microstrip line benchmark with a 50 Ohm lumped port terminating one end and the varactor terminating the other, as shown in Fig. 1. The semiconductor parameters of the varactor diode is shown in Fig. 2, where the SPICE model and related control parameters are also listed. Such model can be easily built in Wavenology EM. Simply click the “SPICE Circuit” elements in the project tree and an input dialog will pop up. Define the circuit structure with SPICE language, and specify the SPICE circuit port location, then the definition is done. The full-wave simulation with non-linear circuit is ready to run. Fig. 1. Transmission line benchmark to test the varactor. Fig. 2. Varactor SPICE model parameters. From the simulation, the effective capacitance of the varactor can be calculated. 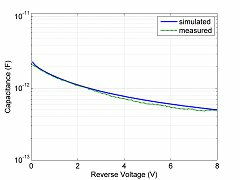 The capacitance obtained from the simulation is compared in Fig. 3 left with the measured data. From the comparison, it is convincing that the model built in Wavenology EM is accurate. 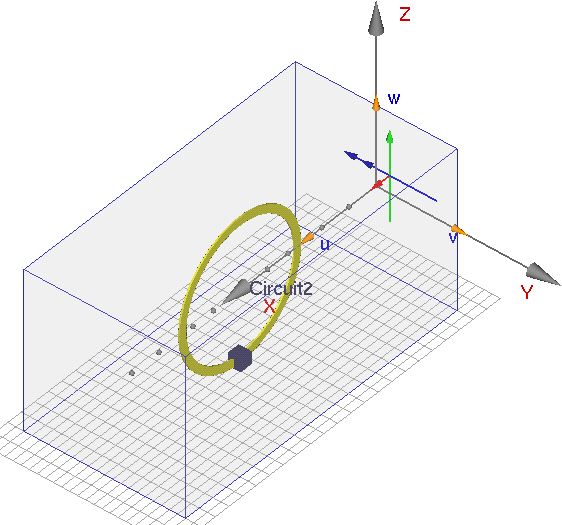 In addition, the I-V relationship of such device is also simulated and is shown in Fig. 3 right. Clear non-linear effect of varactor is observed. Fig. 3. Left: Comparison of the capacitance vs. reverse voltage. Right: I-V relation. 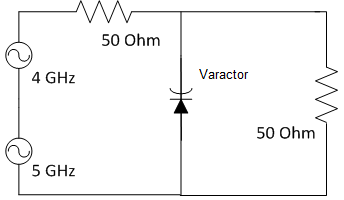 One of the major applications of a varactor diode is the parametric upconverter, which applies the non-linear diodes to generate high order harmonics. In this section, the above modeled varactor is applied in a metal ring mounted on one side of the FR4 substrate. On the other side of the substrate same metal ring is mounted and a lumped voltage source is applied over the gap of the ring. The 3D model is demonstrated in Fig. 4. Fig. 4. Geometry configuration of dual-sided rings. A sinusoid signal at 0.7 GHz with the magnitude of 0.01, 0.1, 0.5 and 1V is applied to the lumped port voltage source, respectively. It can be easily analyzed that due to the oscillating voltage signal, the current flowing along the ring will form an oscillating current loop at 0.7 GHz. Hence there will be a harmonically varying magnetic field generated whose direction is perpendicular to the substrate board. This magnetic field penetrate through the ring on the other side of the substrate and the will induce a current flow through the ring on the varactor side. The induced current will introduce a voltage across the varactor as well. Due to the single direction current flow, only when the induced voltage is greater than the cut-off voltage of the varactor will the current flow through the diode. Such behavior will generate unbalanced magnetic field even though the source is giving balanced signal. Fig. 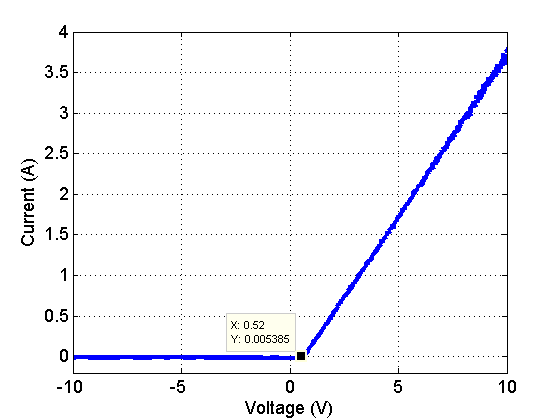 5 shows the voltage induced on the varactor diode with different input voltage levels. Clearly, as the input voltage goes higher, the cut-off effect become more obvious. Fig. 5. 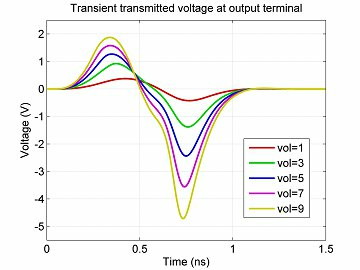 Transient voltage signal across the varactor with different input voltage. Fig. 6 left demonstrates the transient signal of the y-directed magnetic field generated from the metal rings on both side of the substrate. As can be observed, as the input voltage goes higher, the cut-off effect of the diode will generate unbalanced magnetic field. This is reflected in the difference of the minimum and maximum magnitudes of the magnetic field, as can be observed in Fig. 6 left. Fig. 6 right illustrates the spectrum of the transient magnetic field at different input voltage. Clear high order harmonics are observed in the spectrum, since the source signal is at 0.7 GHz, the harmonics should appear at 1.4, 2.1 and 2.8 GHz, which is accurately predicted by the software through a full-wave simulation. Another interesting observation is that the harmonics magnitude is highly depending on the input voltage level. As can be seen in Fig. 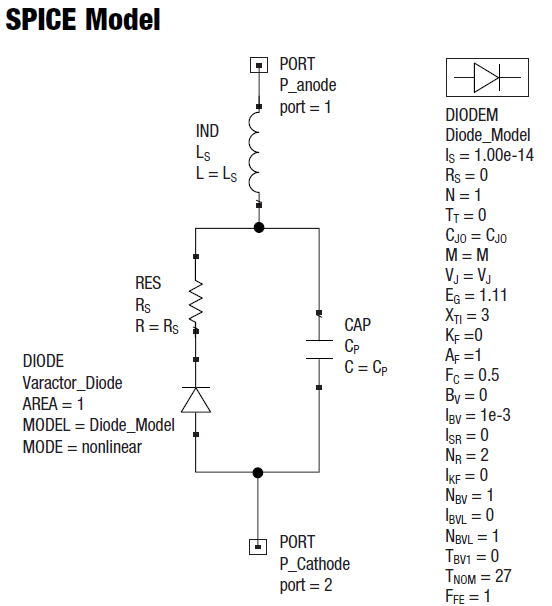 6 right, low input voltage will not induce sufficient voltage on the varactor diode. Thus it will not be turned on and non-linear effects will not appear. As the input voltage level goes higher, stronger harmonics components appeared in the spectrum indicating the diode is active. Fig. 6. 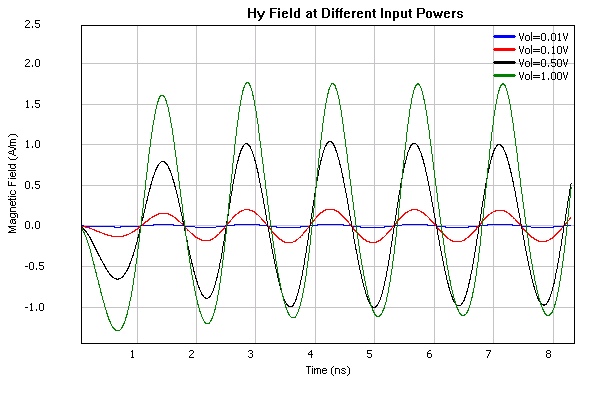 Left: Transient signal of Hy field measured at the ring center with different input voltage. Right: Spectrum of the transient signal at different input voltage. 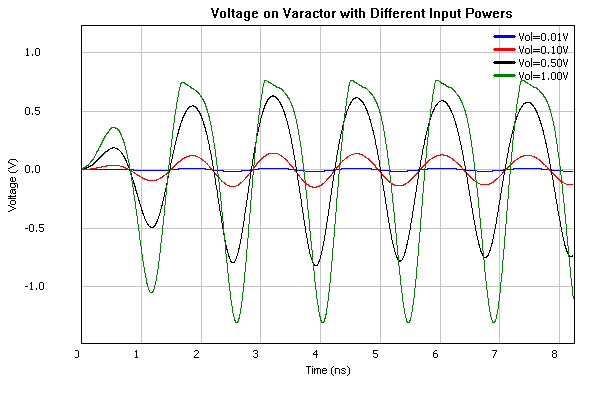 Another major application of varactor is the parametric amplifier. The electronic definition of parametric amplifier is a highly sensitive ultra-high-frequency or microwave amplifier having as its basic element an electron tube or solid-state device whose reactance can be varied periodically by an alternating-current voltage at a pumping frequency. Wavenology EM can easily integrate such non-linear device into full-wave simulations. The following example demonstrates a simple parametric amplifier simulation. The model is a 50 Ohm microstrip transmission line with a 50 Ohm voltage source terminal and a 50 Ohm load terminal at both ends of the transmission line, respectively. The varactor is mounted in the middle. The detail of the model is illustrated in Fig. 7 left. And the equivalent circuit structure is illustrated in Fig. 7 right. Fig. 7. Left: Full-wave setup of varactor used as a parametric amplifier. Right: Circuit diagram of the parametric amplifier. Two voltage sources are applied to the structure as illustrated in Fig. 7 left. The magnitude for the pumping signal (4 GHz voltage source) is set as 5 V and the magnitude for the carrier signal (5 GHz voltage source) is set as 2 V. Two voltage signals are mixed together in a SPICE circuit. 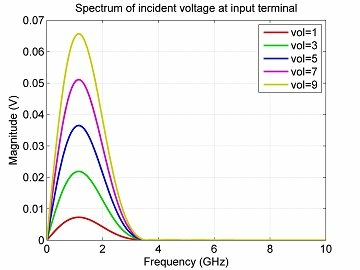 After the full-wave simulation, the transient voltage signal received at the 50 Ohm load is shown in Fig. 8 left, where clear non-linear effects are observed. The spectrum of such transient signal is shown in Fig. 8 right, where harmonics are clearly observed. It should be noted that f_down = 5-4=1 GHz, f_up = 5+4=9 GHz are the frequencies tuned by the varactor. 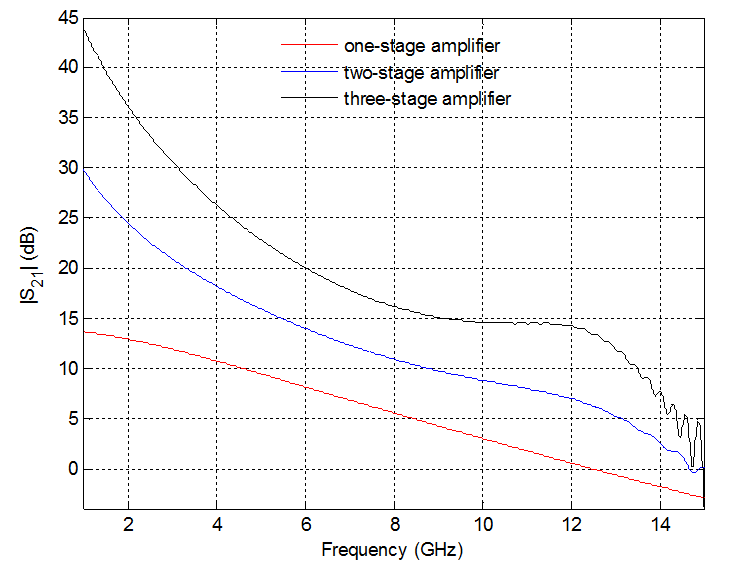 Weaker resonances at 2, 3, 6, 7 and 8 GHz are the secondary harmonics. Fig. 8. 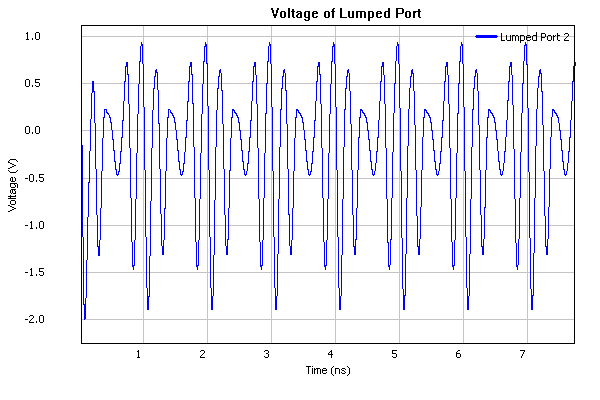 Left: Transient voltage received at the lumped port terminal. Right: Spectrum of the transient signal. The above example use the source which contains only two discrete frequency components (4 GHz and 5 GHz). 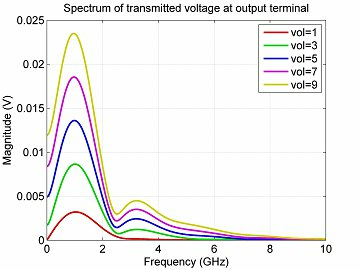 In this example, the transient input signal is a wideband Blackman-Harris Window (BHW) signal with center frequency equal to 1 GHz is applied. The amplitudes of the signal are set to be 1, 3, 5, 7, 9 V, respectively. The transient signals are shown in Fig. 9(a) left. 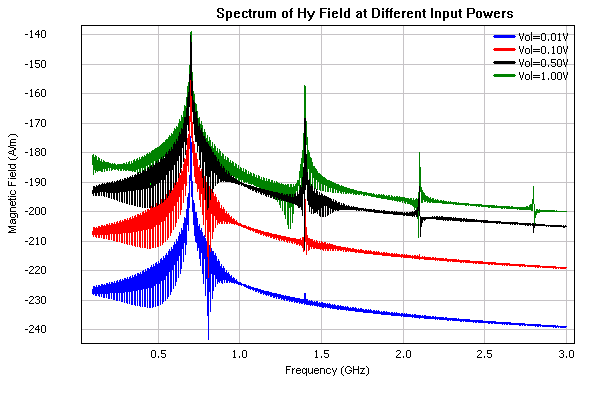 The spectrum of such input signal at different power levels are illustrated Fig. 9(a) right. It is observed that such signal has a bandwidth of approximately 3 GHz and it contains no DC components as indicated in Fig. 9(a) right. Fig. 9. (a) Incident signals; (b) Reflected signals. (c) Transmitted signals. 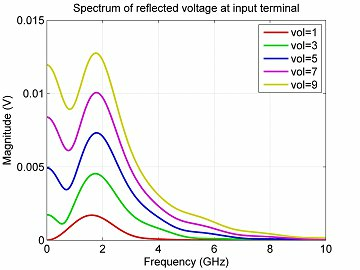 The reflected and transmitted voltages are shown in Fig. 9(b) and 9(c), respectively, with the left figures showing the transient signals and right figures showing their spectrums. From these figures, it is observed that 1) at lower power input, the cut-off effect is not obvious and hence the network behaves almost linear. As the input power goes higher, obvious cut-off effect occurs and both transient and spectrum data reveal some non-linear effects. 2) Due to the non-linearity, high-order harmonic frequency components occurred outside the input frequency range. This is clearly observed in the spectrum of transmitted voltage as shown in Fig. 9(c) right. 3) DC components are also observed in the spectrums of both reflected and transmitted voltages. With all above being realized, transient simulations become advantageous over S-parameters since it does not care about frequency domain responses during the simulation, the non-linear operations can be easily implemented by adding control models over a time-domain signal. Such non-linear operations are coupled with full-wave electromagnetic simulations via iterative interactions. The simulated results are pure time domain signals. The continuous frequency domain responses can be easily obtained by performing a Fourier’s transformation. Recently, non-linear mematerials received great attentions since non-linear devices can dramatically enlarge the potential application range of microwave metamateirals. 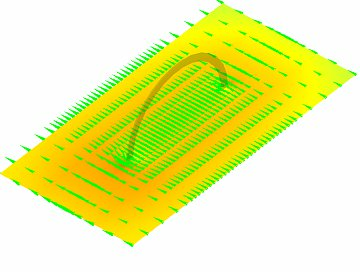 In this section, we demonstrate the ability of Wavenology EM to perform full-wave simulations in non-linear metamaterial research, design and analysis. Fig. 10. Single ring with a varactor. Fig. 10 demonstrates the structure of the this example, where a split ring resonator (SRR) is connected by a varactor over the gap. A TEM plane wave is excited from the X- side to X+ side with the magnetic field oscillating along the Y direction. It is predicted that such magnetic field will induce a current flow together with the electric field. Such induced current will flow back and forth along the SRR if there is no varactor connected. However, due to the varactor, at certain input power level, the induced current is large enough and will turn on the varactor diode. Consequently, a single directed current loop can be formed. Such current loop will generate a magnetic field within the SRR circle and will impact the total magnetic field. In this case, we apply mixed 4 GHz and 5 GHz sinusoid signals as the time signature of the incident plane wave. The magnetic field perpendicular to the SRR surface is measured at different locations, as shown in Fig. 11 left. Here three points were picked, they are x=4mm, x=6.5mm and x=8mm, where y and z coordinates for the three points are zero. Note that the point at x=4 is outside the SRR, and the points at x=6.5 and x=8 are within the SRR. x=10 is the center of the SRR. From Fig. 11 left, it is obvious that the Hy field within the SRR is severely unbalanced in magnitude, where the Hy field outside the SRR does not get much impact. The spectrums of these fields are illustrated in Fig. 11 right. 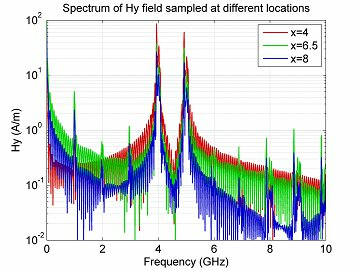 As can be observed, the field outside SRR does not contain strong harmonics, but the field within the SRR contains clear harmonic components. Fig. 11. 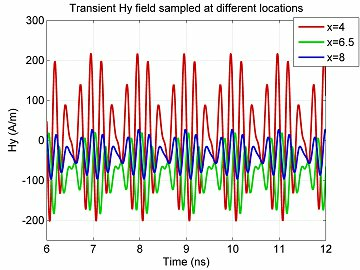 Left: Transient Hy field measured at different locations. Right: Spectrum of the Hy signal. The magnetic fields are also visualized in a 2D face cut that goes through the center of the SRR, as illustrated in Fig. 12. In the left figure, the snapshot is sampled at 99.76 ns, where the varactor diode is turned on. The current flowing through forms a complete current loop and the magnetic field generated by the loop current is superimposed onto the other components of the magnetic field, a clear void zone colored in blue is observed within the SRR due to this non-linear effect. As a comparison in the right figure, the snapshot is sampled at 99.88 ns. The varactor diode is not on. Thus no current loop is formed, and the magnetic field smoothly goes through the SRR without disturbance. Fig. 12. Left: Hy field when varactor is turned on. Right: Hy field when varactor is turned off. The first application is a single stage microwave FET amplifier. 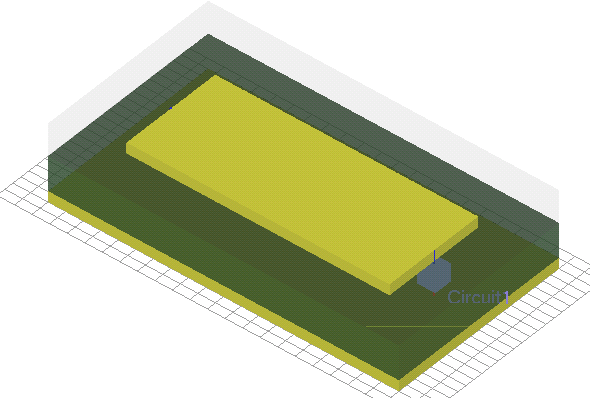 The simulation structure consists of a microwave FET and a microstrip line. Fig. 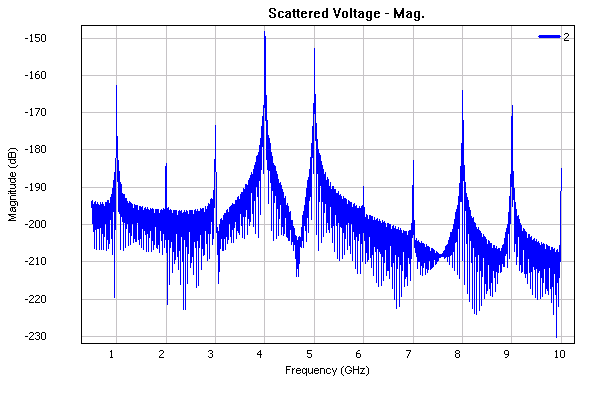 13 shows the configuration of the microwave FET amplifier in Wavenology’s modeling environment. The gray box is the computation domain. Details of geometry parameters of the active device are given in Fig. 14, where the amplifier is connected between points A and B. Fig. 13. (a) The perspective view in Wavenology EM for a microwave amplifier connected to a microstrip line. (b) Top view; (c) Side view. Fig. 14. Detail parameters of the 3D model. The small signal equivalent circuit of the FET is given in Fig. 16(a). Fig. 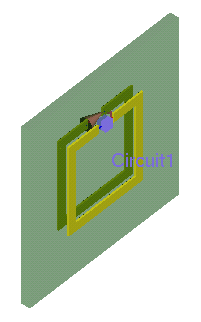 15 gives the SPICE model of the microwave FET and physical position of circuit input and output ports in Wavenology EM simulation environment. Fig. 15. The input interface of the SPICE circuit model of the FET in Wavenology EM. Wavenology EM uses a nonuniform gridding scheme. A BHW pulse time function is applied at Lumped Port 1 on the left end of the microstrip line. The observation port is Lumped Port 2 on the right end of the microstrip line. 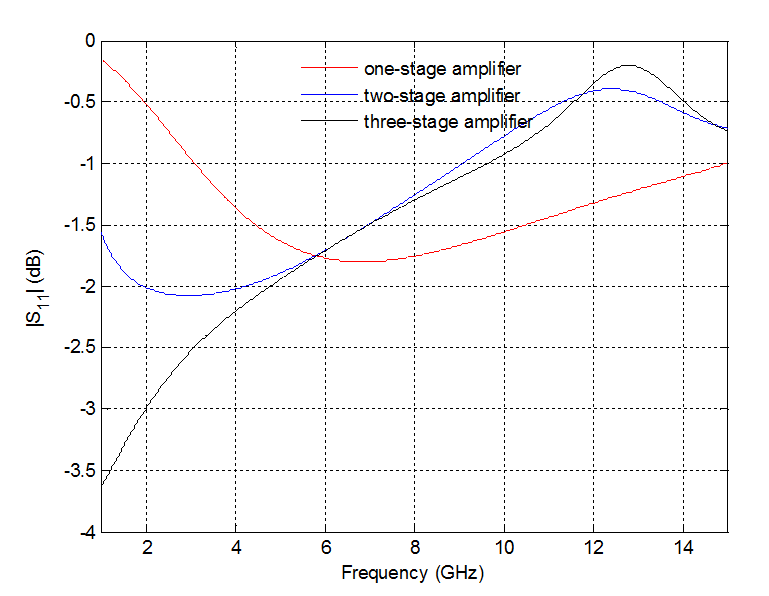 Now we will show the configuration of the two- and three-stage amplifier cases, as shown in Fig. 16(b) and 16(c) to demonstrate our software’s capabilities in simulating complex multiple-stage amplifiers in particular, and multiple circuits in general. Fig. 16. (a) The small signal equivalent circuit of a common-source microwave FET; (b) The small signal equivalent circuit for a two-stage amplifier configuration. (c) The small signal equivalent circuit for a three-stage amplifier configuration. Figs. 16 gives the small-signal equivalent circuit models for the one-, two- and three-stage amplifiers, Fig. 17 and 18 show the comparison of magnitude of S11 for these three cases separately. As seen from Figs. 17 and 18, Wavenology EM can correctly simulate hybrid field-circuit problem with the multi-stage microwave FET amplifier embedded in the gap of a microstrip line. Fig. 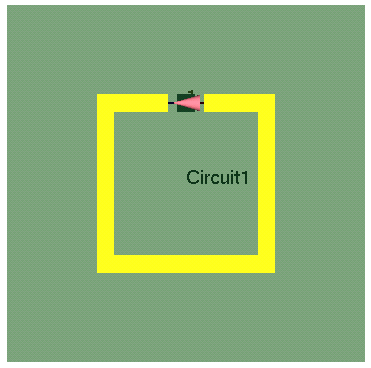 17 Magnitude of the S11 of the amplifier circuit with one, two, and three stages. Fig. 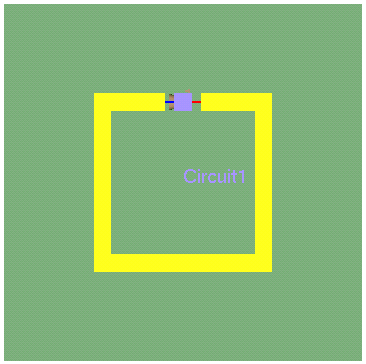 18 Magnitude of the S21 of the amplifier circuit with one, two, and three stages.